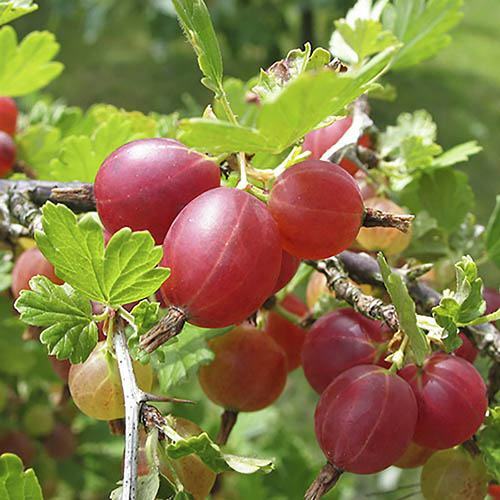 Grow large, sweet, juicy, tasty gooseberries in your garden with this wonderful Hinnomaki red variety. This hardy plant is easy to grow and will establish in your garden to produce white flowers in spring. The fruit will follow and be ready to crop the purple-red fruits every Summer. Great for eating or cooking and delicious used in desserts, preserves, pies and crumbles. Sweet, juicy and with a flavour that far surpasses any of those sour, eye-wincing berries you buy in the shops, home grown gooseberries are a taste sensation that everyone should try. Perfect in a sunny spot,Hinnomaki Red will add an ornamental touch to beds, borders or even in large pots on the patio. Big crops of large, delicious fruit thats ready for picking in mid-summer. Supplied as as an established bush 30-40cm tall, bare root plant, to plant out all year - note, it is dormant in winter, so is supplied without leaves Nov-March/April.